Hillard G. Huntington and Glen E. Schuler, Jr. 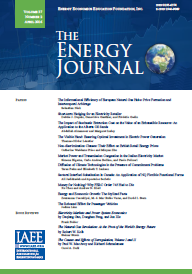 This paper summarizes the research by the Ninth Energy Modeling Forum (EMF) working group which focused on the evolution of the North American natural gas market through 2010.1 The group analyzed four standardized scenarios: upper and lower oil price paths, the low U.S. natural gas resource base, and high U.S. natural gas demand. The group sought to develop insights about the gas market's development under these scenarios by using economic models and additional analyses. Some of the most critical factors highlighted in the study, that will affect the usage and price of gas in the future, are the nature of the gas-oil substitution in the industrial and utility boiler market, which will depend on relative bumertip residual fuel oil to gas prices, the incremental costs of finding and producing additional gas supplies in the U.S. and Canada, and the amount of potential gas imports. This paper analyzes the restructuring of the natural gas industry which has been going on for several years. It gives the background to the current attempts at restructuring and describes Stanford University's 9th study by the Energy Modeling Forum on North American gas markets which is the analytical basis for this paper. It then describes the tension between the two regulatory objectives, economic efficiency and satisfyingpublic policy concerns regarding the distribution of economic surplus, which must be considered in any analysis of regulatory policy and market structure in the natural gas industry. Ten key natural gas policy issues that remain unresolved are analyzed and a more general discussion of how the gas industry may evolve under several alternative sets of market conditions are presented. Finally, it considers howpoliticalpressures may affect gas policies in future. This paper provides a cost-benefit analysis of controlling or decreasing C02 emissions. It uses an analytical framework, called Global 2100, which is designed to evaluated C02 energy economy interactions and estimate the cost of a carbon emissions limit. It analyzes three demand parameters (potential GNP growth, elasticity of price induced substitution between capital-labour and energy, and the rate of autonomous energy efficiency improvements) which are crucial to the debate over energy and environmental futures. The paper discusses various energy sources which are either presently in use or will possibly be in use in the future, and analyzes their impact on cost-benefit analyses. Finally, the paper analyzes the results of carbon constraints and suggests that there is need for more research and development on the subject. Comments on Manne and Richels: "CO2 Emission Limits: An Economic Analysis for the USA"
This paper evaluates the Global 2100 model application on global warming by A. S. Manne and R G. Richels, which is presented in this edition of The Energy Journal The paper discusses Manne and Richels's general analytical framework, the Global 2100 model; and Manne and Richels's exploration of international interdependence, benefit calculations, and the uncertainty which must necessarily accrue to any discussion of global warming. The paper suggests that cost-benefit analyses, such as the one provided by Manne and Richels, are necessary for policy recommendations. Differences in regional impacts of global warming are noted. The paper concludes that Manne and Richels's study is very worthwhile and pleads for further studies. In this paper a simulation model of the West European power plant industry, combined with transboundary source-receptor relationships, is used to determine cost-effective reduction rates for SO2 emissions in any one country so that certain, exogenously given, deposition reduction targets are attained. The overall costs implied by the proposed strategies, and their distribution among countries, are examined and compared to those associated with the traditional emission-standard approach. It is found that the cooperative and flexible strategies considered allow for overall cost savings of up to 60 percent, given the same degree of deposition reduction. This paper analyzes long-term power purchase contracts between an electric utility and a cogenerating facility and suggests ways to improve them. It discusses the best way to construct the contract payment structure in light of the given avoided cost structure; analyzing in detail the harmful incentives to low maintenance and how to avoid them. The paper concludes that the method it describes can be used to aid in the better design of contract provisions that will remedy the problem of incentives to low maintenance. The objective of this study is to determine whether investors perceive utilities with nuclear plants to be more risky than utilities with no nuclear facilities. Two basic analytical frameworks are used. One approach is to analyze investors' differential perception of the market-related systematic risk of nuclear utility stocks versus non-nuclear utility stocks. This is done by comparing the betas of nuclear versus non-nuclear utility stocks. The second approach is an econometric treatment of price to book value ratios, using cross-sectional data in the time period 1973 to 1987. For both approaches, the differences in the financial markets' perception of risk, related to the special events of TMI, Chernobyl and the WPPSS bond default; are analyzed. Based on the cross-sectional analysis of P/BV ratios in recent years, we estimate the financial markets valued nuclear power utilities at approximately 20% less than comparable non-nuclear utilities. We estimate that a 3% increase in the allowed rate of return for nuclear utilities (from 13.7% to 16.7% in 1988) would have been necessary to fully offset the discount associated with nuclear power. A dynamic engineering-based econometric model of the Terns petroleum industry is used to jointly assess the impacts of federal price controls and the windfall profit tax, on both oil and gas supply, over the period 1973-1983. Comparing simulation results obtained using actual prices, and then counterfactual, uncontrolled prices, show small but persistent losses in above-ground production but considerably larger percentage impacts in drilling activity and new reserve additions. Thus, the long-run opportunity costs of post-embargo energy policy may not be fully reflected in traditional calculations that use constant supply elasticities to calculate annual supply impacts without regard to previous years' prices or production levels. This paper analyses energy efficiency in the Mexican cement industry by studying disaggregated data at the plant and production unit level. A short-run production function is examined to look at the substitution possibilities between labour and energy with given equipment, but these are found to be limited (as expected). Instead, reduction of energy use per unit of output is mainly due to capital embodied technical progress: the most important improvements in plant efficiency are related to investments in new pieces of specific equipment. Average energy intensity of the branch as a whole is, therefore, mainly explained by capacity expansion. Finally, the importance of factor prices and the relevance of our results to other industries are discussed.